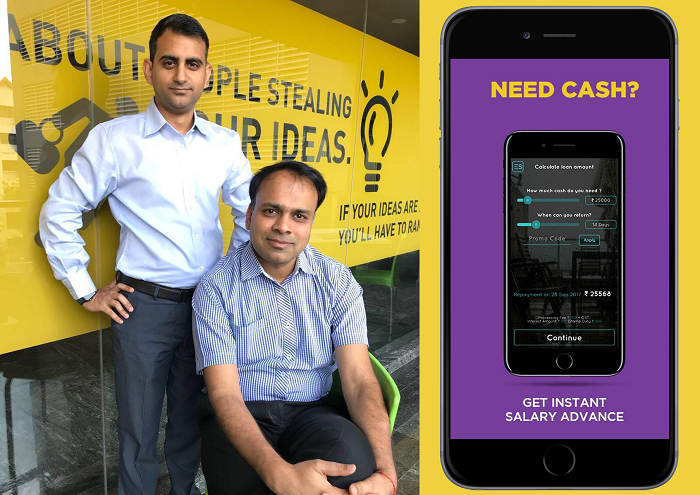 EarlySalary, India’s largest consumer lending mobile application has crossed the INR 1000 crore disbursal mark by virtue of their continuous focus on innovation in the lending space. Akshay Mehrotra and Ashish Goyal established the Pune based startup in 2016. The monthly disbursal rate has seen a significant 200% year on year growth. It has grown from INR 3 crores in March 2017 to INR 34 crores in March, 2018 and to INR 102 crores in March, 2019. The mobile application has been downloaded over 9 million times so far and over 600,000 loans have been disbursed in the last three years. EarlySalary caters primarily to the underserved sections of society such as young salaried professionals as well as the blue and grey collar workers. EarlySalary currently disburses over 60,000 loans a month and less than 3000 of these loans require any kind of human intervention, because of the high level of digitisation that the platform operates on. The decision-making process is based on a unique lending algorithm that combines traditional credit scores with non-traditional data and other parameters linked risk assessment. Both first time and repeat users of the application are reviewed through a unique SocialWorth underwriting system and machine learning platform which allows salaried individuals which includes offering loans to New to Credit (NTC) also. EarlySalary currently has over 225 corporate partners where a total of 5 lakh employees work. They can avail of the salary advances with great ease. EarlySalary’s customers can also avail of the credit line approved to transact on Amazon, Flipkart, MakeMyTrip, Yatra and Big Bazaar. Similarly, additional features now include easy School Fee Finance & Education loans for Skill Upgradation. They also recently opened India’s first ever FinTech SmartOffice in Bengaluru, which acts as an offline channel for customer engagement. Founded by Akshay Mehrotra and Ashish Goyal, EarlySalary is a mobile app, which allows salaried individuals to avail of financial assistance. This is similar to salary advances or credit card cash withdrawals, empowering consumers with ready cash when they need it the most. The company conducts prudent risk assessment by leveraging machine learning to go beyond financial underwriting. EarlySalary raised INR 100 crore funding in January 2018 led by Eight Roads (Fidelity) Ventures. With loans worth INR 1000 crore having already been disbursed, EarlySalary is helping customers borrow within minutes. While concentrating on providing instant loans to young working professionals, EarlySalary has fast become the first line of credit for young working professionals in India. Short duration: Cash loans from 7 days up to 90 days for the first loans and repeat customers can get longer tenure loans also. Shop now and pay later - ability to use the loan limit to shop online on credit on Amazon, Flipkart & BigBazaar. FeES: education loans to pay for your child’s school fees & education needs or pay for a skill upgradation course.